Who you calling pretty boy? 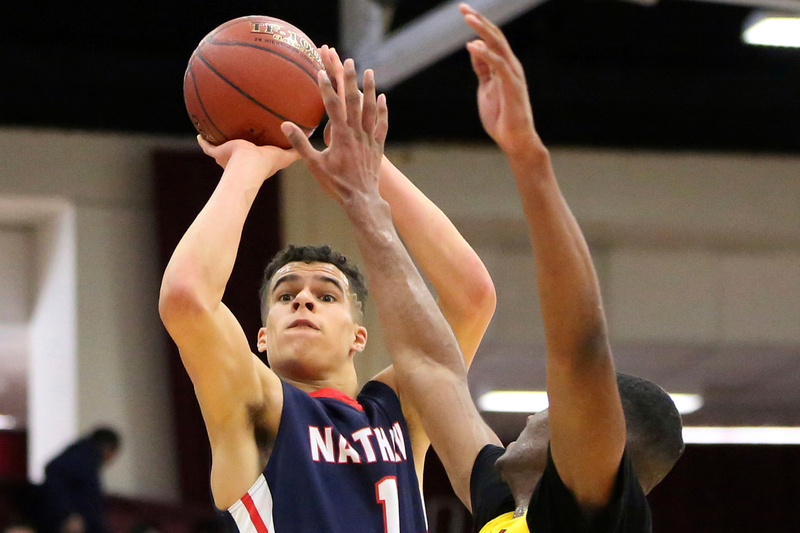 A Q&A with Missouri-bound Michael Porter Jr.
Heralded University of Missouri basketball signee Michael Porter Jr. believes the “soft” label has been put on him at times because he is a light-skinned player with a black father and a white mother. The No. 1-ranked high school basketball player on the ESPN 100 has changed that thinking with his well-rounded hoop game. And if Porter ascends to NBA stardom, as expected, he hopes that he can use basketball as a platform to aid race relations in the United States. Porter headlines Team USA’s talented roster that plays the World Team in the Hoop Summit on Friday night, pitting the top American prep seniors against the top international teens. The 6-foot-10, 215-pounder talked to The Undefeated about race, switching from Washington to Missouri for college, his new hobby and more. Have you dealt with racism personally? I’ve been called the N-word a couple times on social media with people commenting. Those people have nothing better to do. It’s crazy. They’re just looking for attention. I try not to feed into any of it. It’s a real issue. I think racism is an issue. How proud are you of being black and white? I like it. I consider myself black because my dad is black. It’s just crazy seeing my mom and dad interact. They’re different. The way they talk is different. I kind of get some of them both. My mom doesn’t want me to talk a certain way. And then my dad … it’s funny. I can relate to both. You were living in Columbia, Missouri, when the shooting of Michael Brown by a police officer occurred on Aug. 9, 2014, in Ferguson, Missouri. You were 16 years old at the time. Did it have an effect on you? St. Louis is an hour and a half down the road. That was all everyone was talking about in Missouri. It definitely hit home. Not all police are bad. I don’t like when people say, ‘All police are bad.’ There are a lot of nice ones out there. I heard about it … I didn’t hear everything, but I know a ton of racist things were happening. There were death threats to black people. The football team wouldn’t practice until it got fixed. I agree with them. You can’t have that on a college campus. We’re all human beings. We should be able to interact and coexist together. Do you hope in time that you could use your celebrity as a platform to fight against racism? I think so. I have a lot of white friends and a lot of black friends. Like Steph Curry and Drake, both races can relate to them. If I could be one of those people, that would be real cool. How are you dealing with all the media and societal attention as a young basketball star? I just try to stay grounded, stay humble. I was blessed with a lot, so if I can give back in any way … I try to care about other people more than I care about myself. Basketball to me is a platform where I can reach a lot of people. If I could make a change in how people view race, that would be amazing. That would be a dream come true. Nathan Hale’s Michael Porter Jr. (No. 1) shoots a jumper against Oak Hill Academy during a high school basketball game at the 2017 Hoophall Classic in Springfield, Mass. Do you think your generation can bring a change in this country on race relations? I think we could. It would take a lot. It takes young people. … Just the perception of how you’re supposed to be, I think the media has a lot to do with it. But the media also has the power to change how people act. I hope we can, man, for sure. What is it like being a member of such a rich basketball family with parents who played college basketball, two sisters (Bri and Cierra) who play at Missouri, yourself and five younger siblings who play basketball as well? I feel like I was made for basketball. My mom played basketball. She’s 6-4. My dad played basketball. He’s 6-4. They’re basically breeding basketball players, and from top to bottom we play basketball. How good was your mom? She averaged 45 points in high school, if that tells you anything. [The former Lisa Becker] is one of the all-time leading scorers at Iowa. She was on Team USA. She went overseas to play. That was back when there was no WNBA. She was legit. What does it mean for you to represent USA in the Hoop Summit? It’s amazing to represent your country. Every time I put this on, I feel like I have a responsibility to represent how great our country is. I want to prove that USA has the best basketball players in the world. Yeah. It was all of the sudden. One day they were thinking that there was no way Coach Romar would be fired. The next day I was there [at Washington] shooting and I felt some tension there. I was like, ‘What is going on?’ Ten minutes later, it was done. All the coaches were crying and giving me hugs. It was real sad. It was crazy. How did you personally take it? It seemed like the next day you switched your commitment to Missouri. It was a life-changing thing. It was crazy. After Coach Romar got fired, [Columbia, Missouri] is where my family has lived forever. I’m real comfortable with the program, and that is where my sisters play basketball. I know it felt like it was short, but every night we were sitting down talking about it. That was my second choice anyways. I met with [new Missouri] coach Cuonzo [Martin]. I didn’t just jump into it without knowing the coach. He was real cool. I trust my dad. I just decided that it was the best thing for me. How much did your sisters recruit you to Missouri? A lot. They really wanted to bring the family together. We’re big family people. I’m excited. What does it say about your family that they have three kids on athletic basketball scholarship at one school? Three, and maybe four, playing at one school. Actually, my oldest sister [Bri] tore her ACL for the fifth time last year, so she is sitting out. She was the most freak athlete in the family. In the seventh grade she was dunking a tennis ball. She was going to be special, but she had the knee problems. She was playing Division I basketball after four ACL tears. And then the fifth one, I think she’s done. So you recently started taking piano lessons. Can you explain why? Basketball is only going to take me so far. Plus, if you have a bad game and basketball is all you got, then you’re going to be down in the dumps until the next game. And so, for me I always try to remember that basketball is a fun game. And if we play bad, I’ve got other things I like to do. I try to be well-rounded. I love basketball with all my heart, but I try to do other things as well. Porter said he was living in Seattle during the Missouri football boycott. He did not move to Seattle until 2016.